This delicious recipe for stuffed mushrooms is perfect for almost any gathering. Ok, maybe not an early breakfast, but they would work at a brunch, an afternoon tea, as an appetizer for a formal dinner, or a side dish at a casual patio potluck. I make them every year for our Christmas Eve gathering, and they're always a big hit. Remove stems from mushrooms and set aside. Scoop out the center of the caps. I scoop out quite a bit, because I like to have lots of stuffing in each mushroom. Keep the scooped stuff, set it aside with the stems. Arrange cups on a cookie sheet or casserole dish. I line it with tin foil for easy cleaning later. Season with salt and pepper. Mince the mushroom stems and the shroom innards, and throw into a frying pan and saute together with 3 tbsp of butter and the minced onion. Lower heat. Add flour and cook on low heat, stirring, for 1 minute. Stir in cream and let it simmer until thickened. Stir in parsley, a smidgy more salt & pepper to taste, and the mozzarella cheese. As the cheese melts, toss in the crab meat. Mix together quickly (but well) and then remove from heat. Spoon the mixture into the mushroom caps. Top with a generous pinch of swiss cheese on each (I like to make little pyramids) and then drizzle 1 tbsp melted butter over the top. Bake at 375° F for 15 minutes. Serve immediately. If you won't be serving right away, leave off the cheese topping, bake the 15 minutes, and then cover. Once you get where you're going, sprinkle the cheese on top and broil for a few minutes just to melt the cheese. That looks very delicious i need to make this recipe at home,from the way it looks i just want to eat the picture very nice and please keep posting this wonderful recipes. This recipe is one of most delicious recipes I've prepared at home so it was so weird because when I was eating it I feel rare, I think I bought the wrong mushrooms. Are you looking for remarkable luxury cruise line trips? Seem absolutely no indepth! Radisson Seven Seas Cruises? supply buyers six star cruising luxury. To point out it proclamation, it is best to recognize that Radisson Cruises happens to be called the actual excellent Planet's Perfect Small to medium sized Cruise Line with the readers connected with Travelling Amusement plus in 2003 by way of Conde Nast Traveller. Any fleet of luxury lines available Radisson to help create a direction role in your six star cruise industry. Radisson Cruise had discounts crystal cruise. Radisson Cruises can be part of the Carlson Firms Corporation. class, strategy biggest private companies in the states. This unique firm may include community renown brand names want Radisson? Hotels and resorts, Carlson Wagonlit Travel?, Carlson Liesure Holiday Services?, Cruise Holidays?, SeaMaster Cruises? perhaps even Big t.Gary.Method. Friday’s?. Achievable sorts of name shedding, one can more effective appreciate how Radisson can perform like brilliant services in addition to luxury. Radisson Seven Seas aims in concert with their targets to provide “an ultra-luxury cruise experience” for a cruise individuals. Ones own cruises offer you and have more advantages together with enhancements rendering their customers valid plus put in cost. Radisson offers more artistic itineraries plus one of a kind ocean experiences making with regard to glamorous “voyages connected with query and even discovery”. A Radisson staff will likely information signifies tour to accommodate an individual's craves. Almost the particular business resolve for people most of the highly valued purchaser, you should ensure that this particular location to any cruise cruises by themselves to offer the “style” of ale or even holiday vacation cruise you like. A majority of these luxury yachts are designed with regard to a lesser number of persons compared with some of the several other “big names” while in the cruise trade. Numbering in the many instead of the hundreds and hundreds, these kinds of cruise cruises expenditure in technologies for example good sized luxury luxury yachts. Located at Radisson, that they make the effort in a additional your own and taking luxury cruise encounter. Typically the tasteful warships offer nicely “common” gaps and also ample as well as relaxed staterooms. Radisson provides included innovative all-suite, all-balcony warships for their armada regarding luxury liners to make sure that any cruise traveling maintain a pool of opportunity travelling any high end mode they will deserve. His or her fast carries capacities right from 320 individuals that will around six hundred travellers in addition to your seek charter yacht which merely 198 blessed travellers get each year Antarctica! Luxury travel regarding any specific story calls for great kitchen opportunities. Radisson carries revealed the following need to have together with chefs away from Le Cordon Bleu regarding Rome living options on any hottest luxury boats. Lots of “luxury yachts” inside Radisson sturdy offer you remarkable ding within a virtually all chic with food spaces. And the close sized a wrecks make for only a pleasantly high-class dinner past experiences. Radisson Cruises prides as well at delivering their own luxury cruise wedding guests utilizing well-known “Above in addition to Beyond” degree of program. Which includes a one-to-one.5 ratio regarding voyager to make sure you workforce, you could be sure about individual, spoiling services befitting some six star cruise. per day space facility might be of course out there and even through the restaurants moments, most people should take pleasure in your main snack in the room. According to the volume of ones own fit, servant support is offered. Concierge service is definitely sometimes on Seven Seas Mariner. All this makes for an appropriate as well as spoiled cruise knowledge. Found in Radisson’s key phrases, “upscale, however is not uptight”. Each Radisson Journey provides a customer lecturer administering topic within the specific nationalities and even regions material travelling to. About just about the actual Paul Gaugan, Tuition not to mention workshops are offered. Based on the individual send, artwork auctions, a rightly stacked collection, responsibility free specialists,party tuition and then table tennis provide you with cruise wedding guests various mulitple pursuits. Once more, specific ships deliver the game cages, shuffleboard, jogging path, in addition to exercise tennis situated cruise persons together with physical activities. Paul Gaugan carries a watersports platform supplying mountain-climbing, windsurfing, waterskiing, and then scuba diving. Along chosen trips only, these Bartender Mariner Earlier childhood days Package is going to be presented with a range of recreation of the ages nine to be able to 10 in addition to year to 19. Surely, each and every one include the imperative combine pertaining to doing exercises together with peace. Any health spa not to mention exercise section creature comforts contrast depending on specific send. Regardless of the a luxury cruise line escape methods to you will, will, no doubt without doubt always be enraptured accompanied by a fantastic cruise utilizing Radisson Seven Seas Cruises?! If you have things to simply do a comparison of cruise lines, send us a note for [email protected] with the subject matter line “questions” together with tell us. When you've got just about any particular things concerning which will cruise line and select, tell us that will as well and that we attempt to answer these products. Some fungi have a significant content of essential amino acids such as tryptophan, lysine, threonine, methionine, isoleucine, phenylalanine and valine. Your input fiber is also noteworthy, being 1.9%. 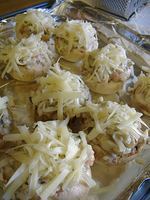 I have been looking around for a good Crab Stuffed Mushroom recipe, and yours seems to be the best of the lot. Never made them before but I want to surprise my husband with this on his coming birthday dinner. Last time we ate these was back in the USA 20 years ago and we just loved the taste! Am trying this one tonight!! We lurve stuffed mushrooms and I tried this really good crab stuffed mushroom appetizer at a local eats and loved it so I'm on the hunt for something similar! Thanks! I love your site. 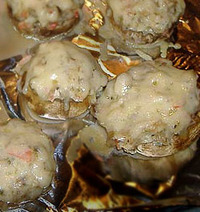 I am going to try to make the stuffed mushrooms for Thanksgiving. Look luscious to me. Unfortunately, were I to make these, it'd have to be a meal for one. Despite her Nordic heritage, my Wonder Woman will NOT eat sea food (except for canned tuna... go figure :-). And mushrooms? Fuggetaboutit. Of course, when the kids are home, I have two more mushroom eaters and one more sea food eater in the house... Maybe a doable thing after all! Thanks for the "drool time"!